After a plane crash, two opposing half-brothers find themselves on an amazing lost island where enlightened pacifist humans and intelligent talking dinosaurs have created a utopian medieval society. But imminent disaster approaches. 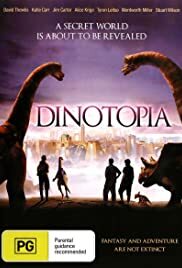 How many episodes of Dinotopia have you seen? Marion: [to Karl] we don't use weapons, for weapons are enemies, even to their owners. A series about a world ruled by a New Age cult,full of brainwashed individuals that do as they are told and go around repeating the most trite haikus/fortune-cooky messages ad nauseum and which have the bad tendency to keep outsiders as their prisoners. What's offensive is that this is not a satire of totalitarian, pseudo-enlightened societies. This is a society that the writers want us to admire! Sorry, but I prefer free will and human rights over robe wearing stupid freaks that read too many bad angel books and would rather condemn their entire population to death than do something non-tantric/Cabbalic.